Ideas have consequences. 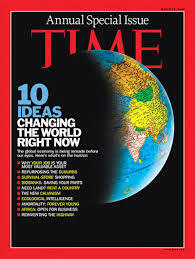 TIME Magazine published their list of 10 Ideas that are Changing the World Right Now. Inspired by Time, I’ve created a list of my own. See if you agree. I love these kinds of things and soak them up like a sponge. However, as a collection of ideas that are changing the world, I found the list uninspiring. But I think I’ll make a passing comment on Ideas #5 — The Amortals and # 3 — The New Calvinism. As fascinating as this Idea is, it describes a trite trend more than an idea that changes the world. American Idol Judge Simon Cowell, who uses botox to look younger, and Madonna are depicted as types of the new Amortals. What is an amortal? Someone whose attitude towards aging has changed. They are eternal teenagers. The infantile urge written about in this idea does describe a species wide and history long tendency of the human heart to wish for eternal youth. This “idea” could have been subsumed under the umbrella of an idea that really is changing the world, namely, the emerging world of biologically engineered humans. Here’s the idea: We no longer need to patiently submit to the guiding hand of Darwinian natural selection for our evolution as a species. The technology (Genetics, Nano-tech, and Robotics) is now emerging that allows us to direct our own evolution. For that matter, we can direct the evolution of any species. We are no longer Homo Sapiens. We are Homo Creadorus, Man the Creator. This idea made me wonder what TIME was thinking about when they created the list. How is a renewal among followers of reformed theology an Idea that is changing the world? The New Calvinism seems more like a desperate attempt to keep the world the same than it does an idea that is changing the world. The article itself tells us that the New Calvinists don’t operate on the scale of the best selling author and evangelical pastor, Rick Warren. How then can the article claim that this is an idea that is changing the world when it openly states that it isn’t as influential as others (i.e. Rick Warren) in the same industry? Congrats to the New Calvinists for the notoriety, but TIME has got to be kidding, right? This is not to say, don’t read the TIME article. The fact that these two Ideas (Amortality and the New Calvinism) are included suggest that Issues of life, meaning, and spirituality are issues that our culture is negotiating, at least in the view of a major publication. It’s definitely interesting and worth a quick read if you like this kind of thing. Here are some ideas that are changing the world that TIME should have considered. I’ll bullet point them today and I will probably extend on these in later posts. — In Korea, if a woman gave birth to a daughter she would sometimes apologize. The depreciation of females is not a thing of the past. In fact, female infanticide is an ancient practice that still exists in the world today. But that is changing. Here’s the idea: girls are of equal value to boys and deserve equal dignity, treatment, and opportunity to pursue personal happiness. This seems “matter of course” to many of you, but if you think it is the matter of course around the world and throughout history, it is because you don’t know the world you live in. This idea is a revolutionary shift in paradigm that is changing the world we live in right now. — The eradication of slavery in the west in the last two hundred years and the election of a black American President point to an idea that is changing the world. Here it is: all people regardless of culture, clan, or color deserve dignity, respect and love. The conversation on race in America for which so many have clamored has, in effect, already been taking place over the last couple of centuries and the good guys are winning. This may feel like a “duh” but it isn’t. We’re winning but we haven’t won. Slavery is still a global reality. Depreciation of others based on color, culture, or class still happens. This is a tectonic shift in paradigms that the whole world will need (and want) to get used to. But we must remain vigilant because it may not take much to experience a global reversal for these first two ideas. — Yes, I know. This is the exact opposite of idea number 2. While depriving dignity to any kind or class of person is no longer imaginable in much of the world, there is a new world rising. Who will benefit from the emerging technologies that will genetically enhance humans? Who will be left behind? Will those with the economic means separate themselves over time by means of genetic enhancements from the rest of us. Will we create a new underclass of “organic” humans who are a different species than a new and more impressive kind of “electronic” human? Here’s the idea: The weakest and most vulnerable among us should share (if they wish) in the benefits of the emerging new species of human we will create. And those who are left behind (by choice) should be protected against the future form of discrimination: speciesism. — There is new term floating around China today that we should be aware of. The term is “leaving the dollar behind.” One hundred years ago the British Pound was the world’s currency. Today it is the American Dollar. Today’s global economy is on the brink of experiencing a deep shift and the Chinese are floating the idea of creating a “backup” currency to the dollar. I have been watching and commenting on the global shift of the world’s center to the Pacific Rim for twenty years now. The question arises: what will be the global currency by century’s end? Here’s the idea: the image of the USA as the sole global power, as the top of the heap, may be eroding. I think the currency at century’s end will still be the dollar, but Ideas have consequences. Great comments and thoughts as usual! Looking forward to the “Hollywood Faith” inteview on Friday! Peace man! Yes, and the first black President is pro-infanticide, and partial-birth abortion. There’s something big time wrong here. Wrong agenda to let a baby born alive die in acloset, for the sake of the woman’s right to kill the baby. Obama has an heart that needs Christ. But, it may well become a Socialist America, and that’s good for the Church, pehaps. One thing is absolutley for sure: Christ will build His Church, and the gates of hell shall no way prevail. Pingback: godthoughts.net » Can ideas change the world? Hi Alex! My name’s Melvin and it’s my first time here. Thanks for the post! Like you, I love ideas, changing the world, and Jesus. I think Time is mainly pointing out the energy and passion. Do you not see these two things permeate from the New Calvinists? I agree that they could’ve put more detail into it though. Like you said: How has it changed the world? Anyway, thanks again for the post and you’ve got a new subscriber here! Hey Melvin, No doubt energy and passion emanate from the New Calvinists. But I think Time totally misses it by thinking that the New Calvinists have a monopoly on “energy and passion” for the gospel. 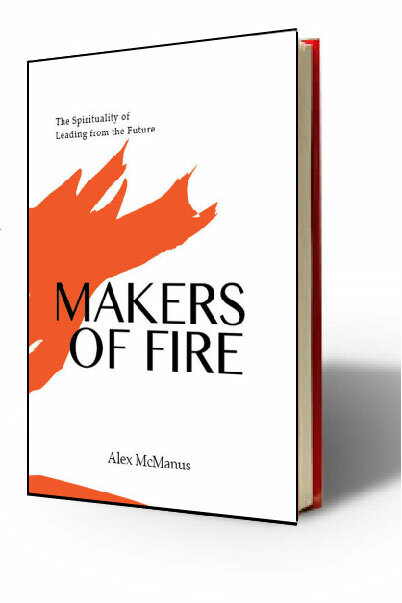 There’ a lot of passion in the evangelical word beyond the New Calvinists. A lot. That’s why I wrote that the article itself points to this. When it comes to energy and passion I find it more widespread than the New Calvinist niche. Thanks for the comment. You belong here.